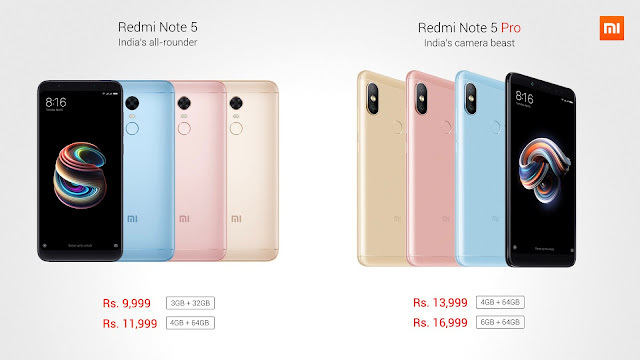 Xiaomi Announces Redmi Note 5 & Redmi Note 5 Pro With Full Screen Display, Camera Improvements & More - AndroGuider | One Stop For The Techy You! After rumors of extinction, the Redmi Note moniker continues to live. 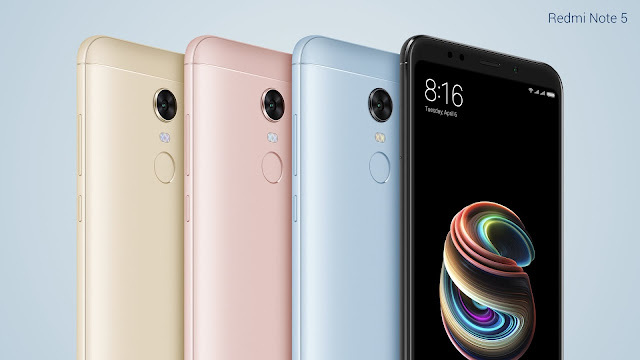 Xiaomi, today, unveiled two new phones under it's popular Redmi Note series - the Redmi Note 5 and Redmi Note 5 Pro. The phones were announced at an event in New Delhi. 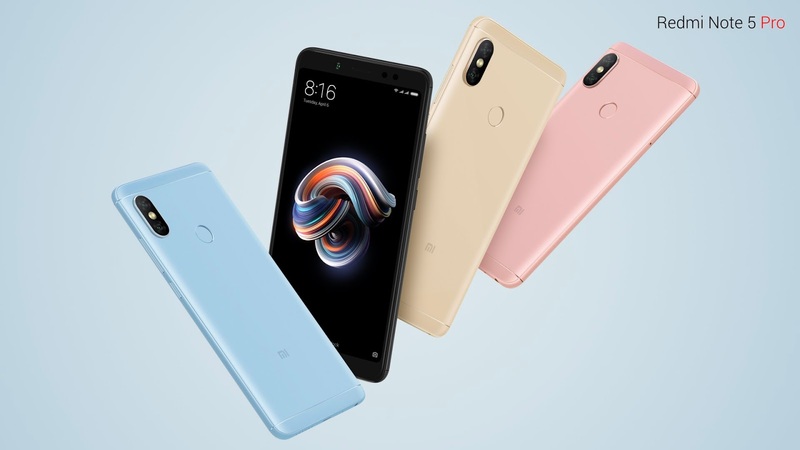 The Redmi Note 5 is simply a rebranded Redmi 5 Plus which was announced in December last year in China. The RN5 and RN5 Pro share several improvements over the RN4. These include an enormous 5.99" 18:9 full screen FHD+ display, and LED selfie flash. Both the RN5 and RN5 Pro are also about half a millimeter thinner than the RN4 and have a dual pyrolytic graphite sheet which can reduce heating by up to 2°C. Just like the RN4, the RN5 is powered by the Snapdragon 625. Xiaomi also talked about how the RN5 can take better low light photos than the RN4 because of the increased pixel size. Xiaomi has done away with the 2GB RAM model for the Redmi Note series. The RN5 is available in two variants - 3GB RAM and 32GB internal storage, or 4GB RAM and 64GB internal storage. There is support for storage expansion via microSD cards. The RN5 is one thousand rupees cheaper than similar variants of the RN4. The base model of the RN5 costs Rs 9,999, and the higher model is priced at Rs 11,999. I found the launch of the RN5 and RN5 Pro to be similar to that of the iPhone 8 and iPhone X. The iPhone 8 is the successor of the iPhone 7, but it's only an iteration upgrade. Apple reserved most of the new features (like facial recognition) and improvements (like the edge to edge display) for the iPhone X. Both the iPhone 8 and iPhone X were introduced in the same event, but it was the X which took the cake. Similarly today, the RN5 Pro stole the spotlight from the RN5. The Redmi Note 5 Pro has the same display as it's sibling, but is powered by even powerful and energy efficient Snapdragon 636. According to Xiaomi, the RN5 Pro is the most powerful Redmi Note phone till date. The RN5 Pro borrows a lot of its features from other smartphones - camera placement and face unlock from the iPhone X, and portrait selfie with a single camera from the Pixel 2. Yes, you read that right. 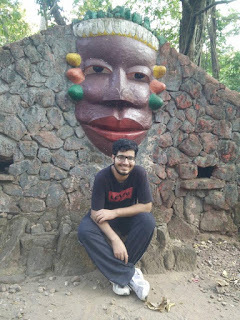 The Redmi Note 5 Pro can capture selfies with bokeh effect. Xiaomi is marketing the RN5 Pro as India's camera beast. The RN5 Pro has a 12MP (Sony IMX486) + 5MP (Samsung sensor) dual camera setup at the back, and a 20MP (Sony IMX376) sensor at the front with selfie flash light. The RN5 Pro also features Electronic Image Stabilization (EIS) for recording shake-free videos. In it's launch presentation, Xiaomi also detailed how it's Beautify 4.0 software is "specifically tuned for India" (Xiaomi showcased that Beautify 4.0 preserves the bindi, which other beautification software do away with) and how it can iron out skin pores and blemishes. All of these features are powered by a non-removable 4000mAh battery. Xiaomi has nailed the pricing too. The Redmi Note 5 Pro is available in two variants - 4GB+32GB and 6GB+64GB. The former model costs Rs 13,999 and the latter is priced at Rs 16,999. Once again, Xiaomi has proven why it is the budget king by offering features from flagships at budget value. You can take a look at the detailed specifications below. Both the phones will go on sale on February 22 and can be purchased from Flipkart, Mi.com, Mi Home stores. The phones will soon be available offline.